The Plecoptera (stoneflies) are a small order of exopterygote insects of about 2000 species worldwide. The order has a long, but rather fragmented, fossil record extending back to the early Permian. These Permian fossils can be rather easily contained in the living suborders, Arctoperlaria and Antarctoperlaria. The modern families are clearly identifiable among specimens from the Baltic amber, which is of Miocene age (38-54 million years ago) as well as a few other compression fossils. 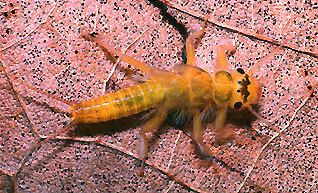 The nymphs of stoneflies dwell in aquatic habitats, although there are some species in the southern hemisphere which spend much time on damp land. In general the preferred habitat is rocky streams with a noticeable current, but there are species that live in sandy places. Cold lakes and ponds are also suitable habitats in the north and at high altitudes. We know far less about lakes as habitats than we do about streams and rivers. In running water the usual nymphal habitats are rocky, stony or gravel substrata, and there are more species in cooler, swifter water. Many studies have shown that the various species are each to be found in particular situations. For instance, large Perlidae and Perlodidae are usually found on and under large stones. Chloroperlidae tend to occur in gravel while Pteronarcyidae, and Nemouridae are most frequently encountered in leaf packs. Finally, it should be stressed that because stoneflies depend upon cool, well-oxygenated water for their nymphal development, they are very susceptible to human abuse of water courses. Any effluent that reduces the oxygen content of the water quickly extirpates them. Even quite minor pollution sources such as farm drainage can elimate stoneflies from nearby streams. Also clearing the land or impoundment or water courses, both of which raise the summer temperature of the water, can eliminate stoneflies from the habitat. Plecoptera, then, as a whole serve as indicators of healthy streams and rivers. Stoneflies are easily recognized by a few simple characters. They have three segmented tarsi but their hind legs are not modified for jumping to the extent of Orthoptera such as crickets and grasshoppers. They have long filiform antennae at least half length of the body. The cerci are generally long as well, especially in the aquatic nymphs. The wings are almost always present but are sometimes very short. They are folded horizontally back over the body. These characters help distinguish them from Dermaptera and Embioptera which they superfically resemble and to which they are probably closely related. The immatures are variously called larvae, or nymphs or naiads, but are most frequently referred to as nymphs. All nymphs are aquatic, and resemble the adults in many respects. They also have three-segmented tarsi. The nymphs always have long cerci and never a third central tail or median caudal filament. Gills, if they have them, can occur on various parts of the thorax and abdomen and are composed only of filaments, not plates. Both Zwick (1973) and C. H. Nelson (1984) list Nemouridae and Notonemouridae as sisters. This is an interesting arrangement because the nemourids are uniquely northern hemisphere in distribution and the notonemourids are uniquely southern hemisphere in distribution. This is the only pattern of this sort at the family level (and below!) in Plecoptera. Nemouridae + Notonemouridae is then placed as sister to Capniidae + Leuctridae. The Pteronarcyidae form a monophyletic group which is most closely related to the Peltoperlidae + Styloperlidae clade (Uchida & Isobe 1989). These three families plus the Perloidea (Perlidae + Perlodidae + Chloroperlidae) have paraglossae and glossae of approximately equal length, and have been called the Systellognatha (sensu Uchida & Isobe 1989). Pteronarcyids, styloperlids, and peltoperlids (Pteronarcyoidea, sensu Uchida & Isobe 1989), however, are more bland in coloration than the predatory systellognaths (Perloidea sensu Uchida & Isobe 1989) as nymphs. The Pteronarcyoidea are herbivorous throughout their aquatic lives. In contrast, the three perloidean families are all carnivores, at least as mature nymphs. The predatory behavior is a synapomorphy for the Perloidea and a symplesiomorphy for the Pteronarcyoidea. The relationship of peltoperlids with other stonefly families has been in question since their initial recognition. Zwick (1973) placed the family as the sister group to Subulipalpia (Perlidae, Perlodidae, and Chloroperlidae) with synapomorphies of: 1, body stout, head prognathous, cockroach-like nymphal body form, and 2, male cercal segments fused. Additional apomorphic features which suggest that the family is monophyletic include: 1, nymphal coxae with flap-like lobe (Claassen 1931); 2, nymphal thoracic sterna enlarged into prominent plates, and 3, molar area of nymphal mandibles with pectinate surface (Stark & Stewart 1981). Stark and Stewart (1981) proposed that the family is more closely related to Pteronarcyidae than the carnivorous Subulipalpia based on: 1, nymphal lacinia tridentate; hemispherical, dorsally flattened eggs; and 3, nymphal tergum 10 with apical spine-like process. The chloroperlids, along with the perlids and perlodids, form a monophyletic trichotomy which has defied splitting despite numerous attempts to determine which family is the nearest sister to which other family. Zwick (1973) listed the chloroperlids as sister to the perlids and cited the synapomorphies for this scheme as having the sternal coxal rotator muscles reduced and having having attachment of muscle I ism 22 shifted from the tip of the furcal arm to near the base (his Fig. 16b). C. H. Nelson (1984) found no resolution to the trichotomy using characters derived from Zwick (1973) and additional characters he explored using numerical cladistic analysis. Allan J.D. 1982. Feeding habits and prey consumption of three setiplapian stoneflies (Plecoptera) in a mountain stream. Ecology 63:26-34. Allan J.D. Flecker A.S. & McClintock N.L..1987. Prey size selection by carnivorous stoneflies. Limnol. Oceanogr. 32:864-72. Baumann R.W. 1979. Nearctic stonefly genera as indicators of ecological parameters (Plecoptera: Insecta). Gt Basin Nat. 39:241 244. Benfield E.F.1974.Autohemorrhage in two stoneflies (Plecoptera) and its effectiveness as a defense mechanism. Ann. ent. Soc. Am. 67:739. Bottorff R.L & Knight A.W. 1987. Ectosymbiosis between Nanocladius downesi (Diptera: Chironomidae) and Acroneuria abnormis (Plecoptera: Perlidae) in a Michigan stream, USA. Ent. Gen.12:97-1113. Brinck P. 1949. Studies on Swedish stoneflies. Opusc. Ent. Suppl. 11:1-126. Brittain J.E. & Mutch R.A.1984.The effect of water temperature on the egg incubation period of Mesocapnia oenone (Plecoptera) from the Canadian Rocky Mountains. Can. Ent. 116:549-554. Bukantis R.T. & Peckarski B.L. 1985. Observations on the emergence and habits of Agnetina capitata and Acroneuria carolinensis (Plecoptera: Perlidae). Am. Midl. Nat. 114:200-204. Claassen P.W. 1931. Plecoptera nymphs of North America. Thomas Say Foundation, Springfield, Ill. 199 pp. Claassen P.W. 1940. A catalogue of the Plecoptera of the world. Mem. Cornell Univ. agric. Exp. Stn 232:1-235. Claire E.W. & Phillips R.W. 1968. The stonefly Acroneuria pacifica as a potential predator on salmonid embryos. Trans. Am. Fish. Soc. 97:50-52. Colby C. 1972. Salt and water balance in stonefly naiads, Pteronarcys californica Newport. Comp. Biochem. Physiol. 4:851-860. Dahlberg B.& Müller K. 1981. Faunistical and behavioural studies on stoneflies (Plecoptera) in a coastal stream and its estuary. Fauna Norrlandica 6:18 pp. Dosdall L.N. & Mason P.G. 1981. A chironomid (Nanocladius (Plecopterocoluthus) branchicolus: Diptera) phoretic on a stonefly (Acroneuria lycorias: Plecoptera) in Saskatchewan. Can. Ent. 113:141-147. Feltmate B.W. & Williams D.D. 1989. Influence of rainbow trout (Oncorhynchus mykiss) on density and feeding behaviour of a perlid stonefly. Can. J. Fish. aquat. Sci. 46:1575-1580. Feltmate B.W. & Williams D.D. 1991. Path and spatial learning in a stonefly nymph. Oikos 60:64-68. Feminella J.W. & Stewart K.W. 1986. Diet and predation by three leaf-associated stoneflies (Plecoptera) in an Arkansas mountain stream. Freshwat. Biol. 16:521-538. Flannagan J.F. & Cobb D.G. 1991a. Emergence of stoneflies from the Roseau River, Manitoba. Am. Midl. Nat. 125:47-54. Frison T.H. 1929. Fall and winter stoneflies, or Plecoptera, of Illinois. Bull. Ill. nat. Hist. Surv. 18:345-409. Frison T.H. 1935. The stoneflies, or Plecoptera, of Illinois. Bull. Ill. nat. Hist. Surv. 20:281-471. Harper P.P. 1973a. Life histories of Nemouridae and Leuctridae in southern Ontario. Hydrobiologia 41:309-356. Harper P.P. 1973b. Emergence, reproduction and growth of setipalpian Plecoptera in southern Ontario. Oikos 24:94-107. Harper P.E. 1979a.Observations on the early instars of stoneflies (Plecoptera). Gewäss.Abwäss. 64:18-28. Harper P.P. 1979b. 26. Plecoptera. in Danks H.V. (ed.). Canada and its insect fauna. Mem. ent. Soc. Can.1 08:311-313. Harper P.P 1989. Zoogeographical relationships of aquatic insects (Ephemeroptera, Plecoptera, and Trichoptera) from the eastern James Bay drainage. Can. Fld Nat. 103:535-546. Harper P.P. & Harper F. 1983. Biogéographie et associations des plécoptères d'hiver du Québec méridional (Plecoptera: Capniidae et Taeniopterygidae). Can. Ent. 115:1465-1476. Harper P.P. & Hynes H.B.N. 1970. Diapause in the nymphs of Canadian winter stoneflies. Ecology 51:925-927. Harper P.P. & Pilon J.-G.1970.Annual patterns of emergence of some Quebec stoneflies (Insecta: Plecoptera). Can. J. Zool. 48:681-694. Harper P.P. & Stewart K.W. 1984. 13. Plecoptera. in Merritt R.W. & Cummins K.W. An introduction to the aquatic insects of North America. 2nd edn. Kendall/Hunt Publ.Co., Dubuque, Iowa. pp 182-230. Hoke G. 1924. The anatomy of the head and mouth parts of Plecoptera. J. Morph. 38:347-373. Hynes H.B.N. 1941. The ecology and taxonomy of nymphs of the British Plecoptera with notes on the adults and eggs. Trans. R. ent. Soc. Lond. 81:459-557. Hynes H.B.N. 1976. Biology of Plecoptera. Ann. Rev. Ent. 26:135-153. Hynes H.B.N. 1988. Biogeography and origins of the North American stoneflies (Plecoptera). Mem. ent. Soc. Can. 144:31-37. Jewett S.G. 1963. A stonefly aquatic in the adult stage. Science N.Y. 139:484-485. Jop K.M. & Stewart K.W. 1987. Annual stonefly (Plecoptera) production in a second order Oklahoma Ozark stream. J. N. Am. benth. Soc. 6:26-34. Kapoor N.N. 1974. Some studies on the respiration of stonefly nymph , Paragnetina media (Walker). Hydrobiologia 44:37-41. Kapoor N.N. 1979. Osmotic regulation and salinity tolerance of the stonefly nymph Paragnetina media. J. Ins. Physiol. 25:17-20. Kerst C.D. & Anderson N.H. 1975. The Plecoptera community of a small stream in Oregon, U.S.A. Freshwat. Biol. 5:189-203. Knight A.W. & Gaufin A.R. 1963. The effect of water flow, temperature, and oxygen concentration on the Plecoptera nymph, Acroneuria pacifica Banks. Proc. Utah Acad. Sci. 40:175-184. Knight A.W. & Gaufin A.R. 1964. Relative importance of varying oxygen concentration, temperature, and water flow on the mechanical activity and survival of the Plecopteran nymph, Pteronarcys californica Newport. Proc. Utah Acad. Sci. 41:14-28. Knight A.W. Nebeker A.V. & Gaufin A.R. 1965a. Description of the eggs of common Plecoptera of Western United States. Ent. News 76:105-111. Knight A.W. Nebeker A.V. & Gaufin A.R. 1965b. Further descriptions of the eggs of Plecoptera of Western United States. Ent. News 76:233-239. Lehmkuhl D.M. 1971. Stoneflies (Plecoptera: Nemouridae) from temporary lentic habitats in Oregon. Am. Midl. Nat. 85:514-515. Maketon M. & Stewart K.W. 1984. Drumming behavior in four North American Perlodidae (Plecoptera) species. Ann. ent. Soc. Am. 77:621-626. Maketon M. & Stewart K.W. 1988. Patterns and evolution of drumming behavior in the stonefly families Perlidae and Peltoperlidae. Aquat. Ins. 10:77-98. Masteller E.C. 1983. Emergence phenology of Plecoptera from Sixmile Creek, Erie County, Pennsylvania, USA. Aquat. Ins. 5:1-8. Modlin R.F. & Jayne R.D. 1981. The effect of temperature on the oxygen consumption of three species of Isoperla (Plecoptera: Perlododae). J. Freshw. Ecol. 1:299-306. Moore K.A. & Williams D.D. 1990. Novel strategies in the complex defense repertoire of a stonefly (Pteronarcys dorsata) nymph. Oikos 57:49-56. Mullen G.A.1979.Aquatic mites parasitic on stoneflies in North America. in Rodriguez J.G. (ed.). Recent advances in acarology. 5th int. Congr. Acarology, East Lancing, Mich. 1978. 2:481-484. Nebeker A.V. 1971. Effect of water temperature on nymphal feeding rate, emergence, and adult longevity of the stonefly Pteronarcys dorsata. J. Kans. ent. Soc. 44:21-26. Nebeker A.V. & Gaufin A.R. 1967. Factors affecting wing length and emergence in the winter stonefly Capnia nana. Ent. News 78:85-92. Needham J.G. & Claassen P.W. 1925. A monograph of the Plecoptera or stoneflies of America north of Mexico. Entomological Society of North America. Thomas Say Foundation 2: 397 pp. Nelson C.H. 1982. Notes on the life histories of Strophopteryx limitata Frison) and Oemopteryx contorta (Needham and Claassen) (Plecoptera: Taenipoterygidae). J. Tenn. Acad. Sci. 57:9-15. Nelson, C. H. 1984. Numerical cladistic analysis of phylogenetic relationships in Plecoptera. Ann. Entomol. Soc. Amer. 77: 466-473. Nelson C.R. & Baumann R.W. 1987. Gynandromorphism in the winter stonefly genus Capnia (Plecoptera: Capniidae). Ent. News 98:224 229. Nelson C.H. & Garth R.E. 1984. Oxygen consumption of several species of Plecoptera. J. Tenn. Acad. Sci. 59:27-28. Nelson C.H. Mayfield S.M. & Garth R.E.1990. The effect of temperature and body weight on the oxygen consumption rate of the nymphs of Pteronarcys scotti Ricker and Acroneuria abnormis (Newman) (Insecta: Plecoptera). J. Tenn. Acad. Sci. 65:25 8. Newcomer E.J. 1918. Some stoneflies injurious to vegetation. J. agric. Res. 1:37-42. Peckarsky B.L. 1984. Predator-prey interactions among aquatic insects. in Resh V.H. & Rosenberg D.M. (eds). The ecology of aquatic insects. Praeger, New York. pp 196-254. Peckarsky B.L. 1991. Mechanisms of intra- and interspecific interference between larval stoneflies. Oecologia 85:521-529. Perry W.B. Benfield E.F. Perry S.A. & Webster J.R. 1987. Energetics, growth and production of a leaf-shredding stonefly in an Applachian Mountain stream. J. N. Am. benth. Soc. 6:12-25. Schoenemund E. 1924. Plecoptera, Steinfliegen. in Schulze P. Die Biologie der Tiere Deutschlands. Berlin 32:1-34. Selgeby J.H. 1974. Immature insects (Plecoptera, Trichoptera and Ephemeroptera) collected in deep water in western Lake Superior. J. Fish. Res. Bd Can. 31:109-11. Sheldon A.L. 1972. Comparative ecology of Arcynopteryx and Diura (Plecoptera) in a California stream. Arch. Hydrobiol. 69:521 546. Shepard W.D. & Stewart K.W. 1983. Comparative study of the nymphal gills in North American stonefly genera (Plecoptera) genera and a new, proposed paradigm of Plecoptera gill evolution. Misc. Pubn ent. Soc. Am. 13: 55: 57 pp. Snellen R.K. & Stewart K.W. 1979a. The life cycle of Perlesta placida (Plecoptera: Perlidae) in an intermittent stream in northern Texas. Ann. ent. Soc. Am. 72:659-666. Snellen R.K. & Stewart K.W. 1979b. The life cycle and drumming behavior of Zealeuctra claasseni (Frison) and Zealeuctra hitei Ricker and Ross (Plecoptera: Leuctridae). Aquat. Ins. 1:65-89. Stanford J.A. & Ward J.V.1988.The hyporheic habitat of river ecosystems. Nature, Lond. 335:64-6. Stark B.P & Lentz D.L. 1992. Dominoperla antigua (Plecoptera: Perlidae), the first stonefly from Dominican amber. J. Kans. ent. Soc. 65:93-96. Steffan A.W. 1965. Plecopterocoluthus downesi gen. et sp. nov. (Diptera: Chironomidae) a species whose larvae live phoretically on larvae of Plecoptera. Can. Ent. 97: 1323-1344. Stewart K.W. & Maketon M. 1991. Structures used by nearctic stoneflies (Plecoptera) for drumming, and their relationship to behavioral pattern diversity. Aquat. Ins. 13:33-53. Stewart K.W. & Stark B.P. 1988.Nymphs of North American stonefly genera (Plecoptera). Entomological Society of America. Thomas Say Foundation 12:460 pp. Stewart K.W. Baumann R.W. & Stark B.P. 1974. The distribution and past dispersal of southwestern United States Plecoptera. Trans. Am. ent. Soc. 99:507-546. Stewart K.W. Szczytko S.W. & Stark B.P. 1982a. Drumming behavior of four species of North American Pteronarcyidae (Plecoptera): dialects in Colorado and Alaska Pteronarcella badia. Ann. Soc. ent. Am. 75: 530-533. Szczytko S.W. & Stewart K.W. 1979. Drumming behavior of four Western Nearctic Isoperla (Plecoptera) species. Ann. ent. Soc. Am. 72:781-786. Tozer W. 1979. Underwater behavioural thermoregulation in the adult stonefly, Zapada cinctipes. Nature, Lond.281:566-567. Uchida, S. and Y. Isobe. 1989. Styloperlidae, stat. nov. and Microperlinae, subfam. nov. with a revised system of the family group Systellognatha. Spixiana 12: 145-182. Ward J.V. 1984. Diversity patterns exhibited by the Plecoptera of a Colorado mountain stream. Annls Limnol. 20:123-128. Wolf B. & Zwick P. 1989.Plurimodal emergence and plurivoltinism of Central European populations of Nemurella pictetii (Plecoptera: Nemouridae). Oecologia 79:431-438. Wu C.F. 1923. Morphology, anatomy and ethology of Nemoura. Bull.Lloyd Libr. Ent. Ser. 3:46 pp. Ziegler D.D. & Stewart K.W. 1977. Drumming behavior of eleven nearctic stonefly (Plecoptera) species. Ann. ent. Soc. Am. 70:495 505. Zwick, P. 1973. Insecta: Plecoptera. Phylogenetisches System und Katalog. Das Tierreich 94. Walter de Gruyter and Co., Berlin. 465 pp. Zwick P. 1980. Plecoptera (Steinfliegen). Handbuch der Zoologie 2: 1 115. Walter de Gruyter, Berlin. I thank Noel Hynes for graciously granting access to the manuscript from which the Introduction and References were distilled.